The Jackson Center hosted Judicial Hearing Officer Judge Joseph Gerace as the keynote speaker for the 2nd Annual Stanley Weeks Law Day Lecture co-hosted by the Ancient Accepted Scottish Rite of Freemasonary Valley of Jamestown on Monday April 28th. Gerace’s address focused on voting rights following the 2014 Law Day theme American Democracy and the Rule of Law: Why Every Vote Matters. Following his presentation was “A Conversation with Judge Gerace” where board member and co-founder of the Jackson Center Greg Peterson interviewed Gerace about the highlights of his early career as a local attorney and his many dedicated years spent in public service. Law Day is a national day set aside to celebrate the rule of law, and recognize how law and the legal process contribute to American citizens’ freedoms. This year’s theme focused on the history and importance of voting rights. Gerace’s address charted the history of voting rights and the barriers many minorities have faced in obtaining and exercising their right to vote. He also discussed contemporary issues American citizens face with voter registration and voting rights. In his speech Gerace underlined the importance of laws that ensure proper voting regulation, and he highlighted several ways that citizens could have easier access to the voting process. Some of these ways include use of the internet for registration and voting, same day registration, reducing obstacles for absentee voters and quicker polling processes. The 2nd Annual Stanley Weeks Law Day Lecture honors two of Chautauqua County’s most prominent community leaders. The program’s namesake, Stanley Weeks was a highly accomplished attorney and active community leader, serving as Mayor of the City of Jamestown, Jamestown Board of Education, County Board of Supervisors, Director of Jamestown Chamber of Commerce along with many additional leadership roles for area organizations. Weeks was also an ardent Freemason, serving in many official roles for local lodges. This event was made possible through the support of the following sponsors: Law Offices of Lewis & Lewis, PC, Robert A. Maytum, Sr./Valley of Jamestown A.A.S.R. Fund and Stanley A. Weeks /Robert H. Jackson Fund with the Chautauqua Region Community Foundation. 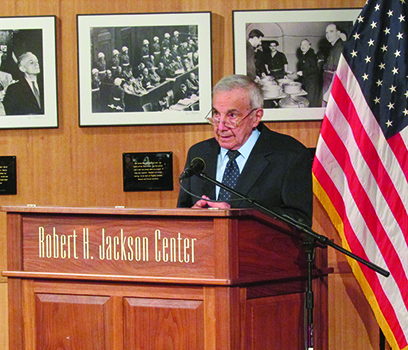 The Robert H. Jackson Center’s mission is to advance the legacy of Robert H. Jackson—U.S. Supreme Court Justice and Chief U.S. Prosecutor of the major Nazi war criminals following WWII at the International Military Tribunal (IMT) trial at Nuremberg—through education and exhibits, and by pursuing the relevance of his ideas for future generations. The Center is located at 305 East Fourth Street, Jamestown, NY. Tours are available from 10 a.m. – 2 p.m., Monday – Saturday. For more information, or to schedule a tour of the Center outside of regular business hours, e-mail info@roberthjackson.org or contact the Robert H. Jackson Center at (716) 483-6646. Find the Center on facebook.com/roberthjacksoncenter to follow our upcoming event pages.